Kenya Airways plane at Jomo Kenyatta International Airport. 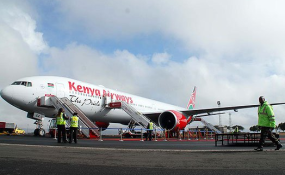 Kenya Airways has postponed the launch of its direct flight from Nairobi's Jomo Kenyatta International Airport (JKIA) to the Somali capital Mogadishu indefinitely. In a statement on Tuesday, Kenya Airways CEO Sebastian Mikosz however said the airline would not fly to Somalia until further notice as it is still facing a delay in getting "additional operational requirements" to fly on the route. "There is delay in KQ getting the additional operational requirement----and the launch has been postponed until further notice," said Mr Mikosz. Djibouti and Southern Sudan flatly declined KQ's applications. Kenya Airways 's chief executive last week told Parliament that the rejections are "politically motivated" and are hampering the carrier's regional expansion plans.